Finally the day is here. It started off slow with a light drizzle in the morning. 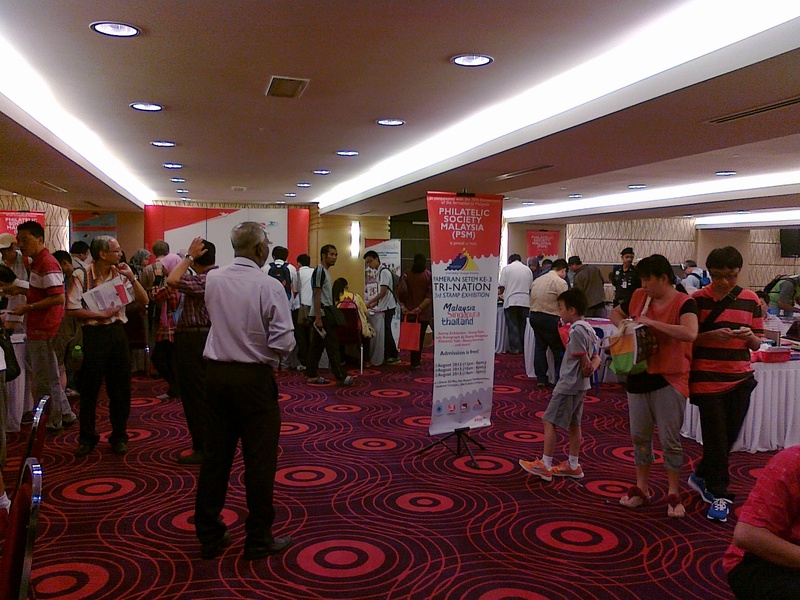 I guess many collectors saw the posters and banner stating 12 noon opening ceremony and thus did not turn up so early. It was a breeze to pick up all the items by 9:00 am. All the regulars were there (less than 10 of us). 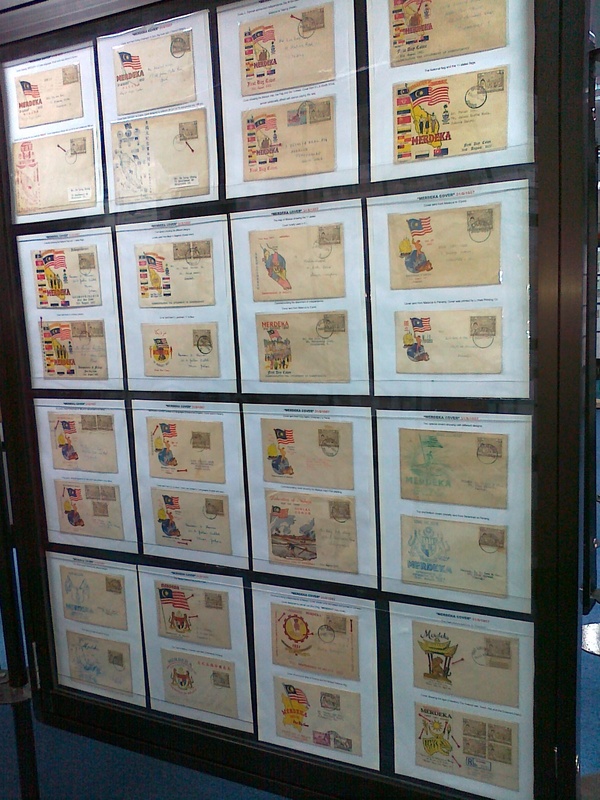 Singapore Post was the only postal authority selling on that day. 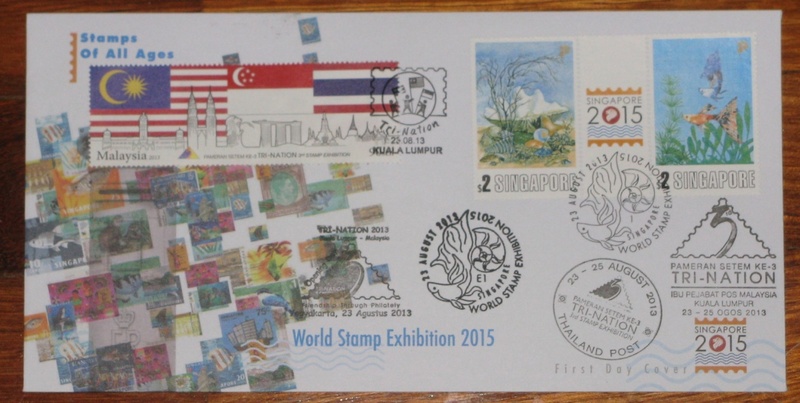 The Singapore 2015 Series 2 stamps and perforated miniature sheets were on sale. By noon the empty FDC envelopes were all sold out!!! The cancel used was the “E1” exhibition postmark! Collectors item! 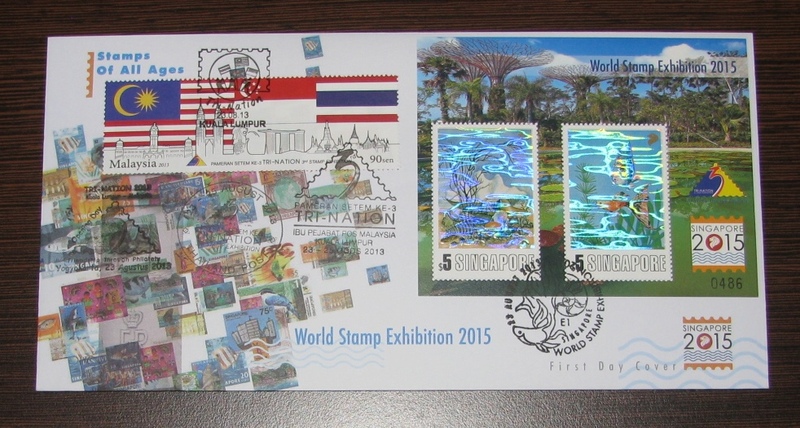 Thailand Post sent their cachet to Pos Malaysia for stamping at the main stamping counter. 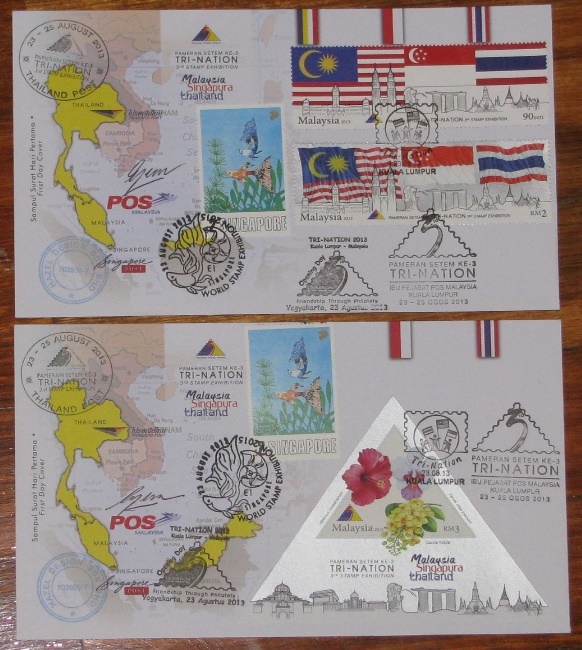 Pos Indonesia sent ready made souvenir exhibition cover sets (of 3) to Pos Malaysia Philatelic Bureau to sell. The set consists of 3 covers cancelled with daily cancellations. By late evening, the cancel was also under the care of Pos Malaysia for stamping purposes. 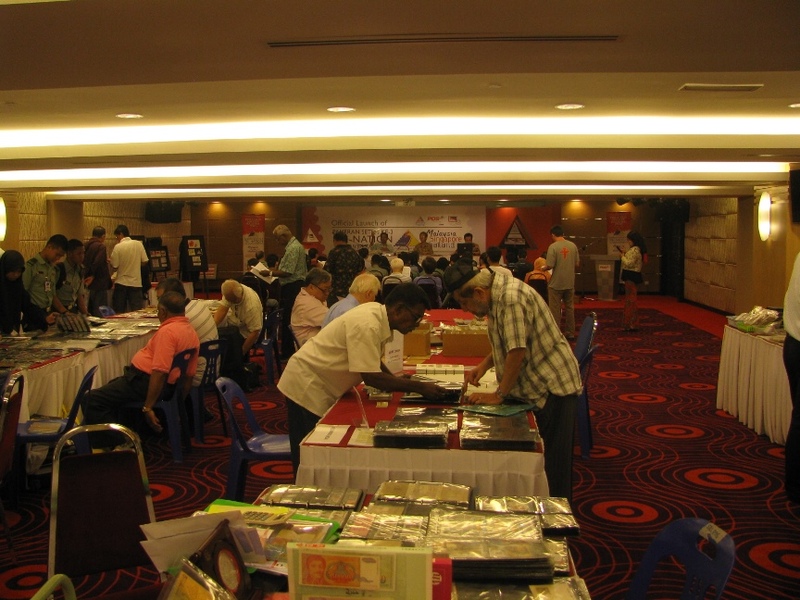 Here is the hall on Level 2. Crowded but lively. The right near the banner is the PSM Counter. Singapore Post is at the back near the pillar (hidden from view). Tomorrow I will head to the exhibits since most of today has been running around getting all the right cancels. So here is what I managed to make. 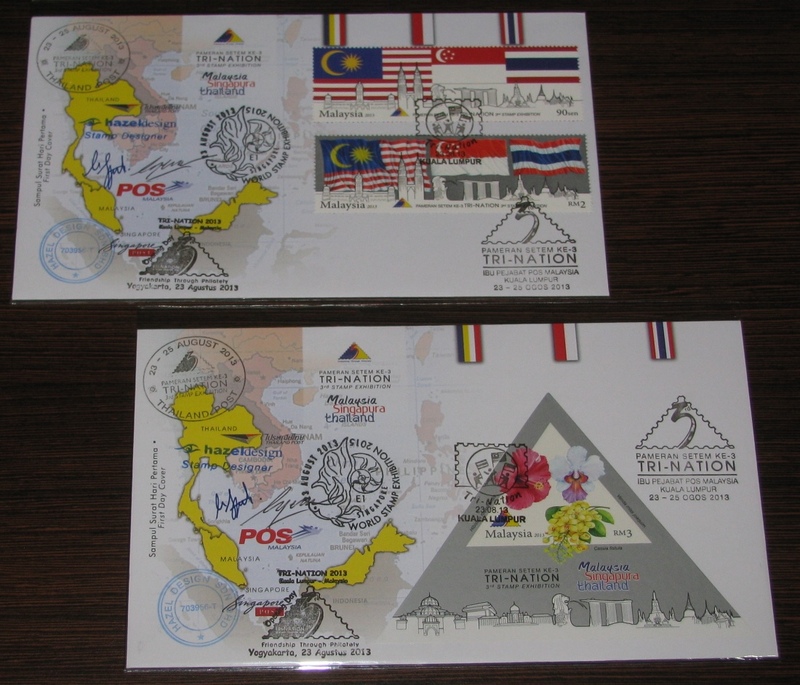 Malaysia FDC set with everything (latest info: If you want second designer’s signature, scroll down). Malaysia (PSM) postcard with everything. I have ONE empty folder and am giving away 2 posters. The error poster with a correction sticker and a corrected poster available today (signed by the designer!). 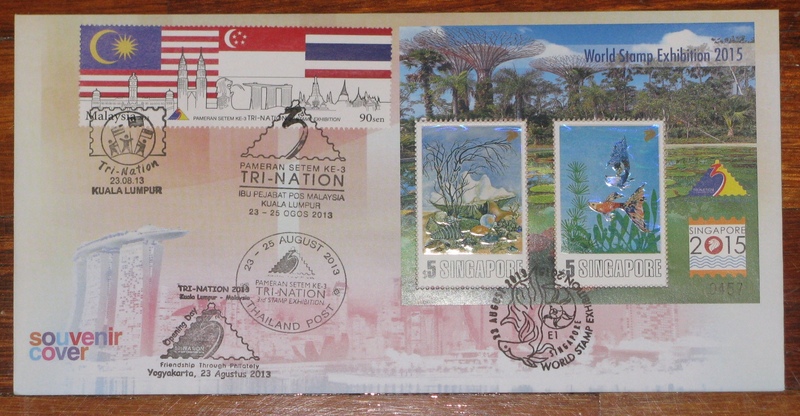 The Singapore Tri-nation Overprint Miniature Sheet came very late in the afternoon at a very high price tag! Again, first come first served. Remember the Thailand 2013 FDC? I only get the messages after it was sold out and then they want to stocks. Before that look and look and look. Singapore collectors are still coming strongly. They came in bus and own cars yesterday. So naturally Singapore Post’s business is roaring! 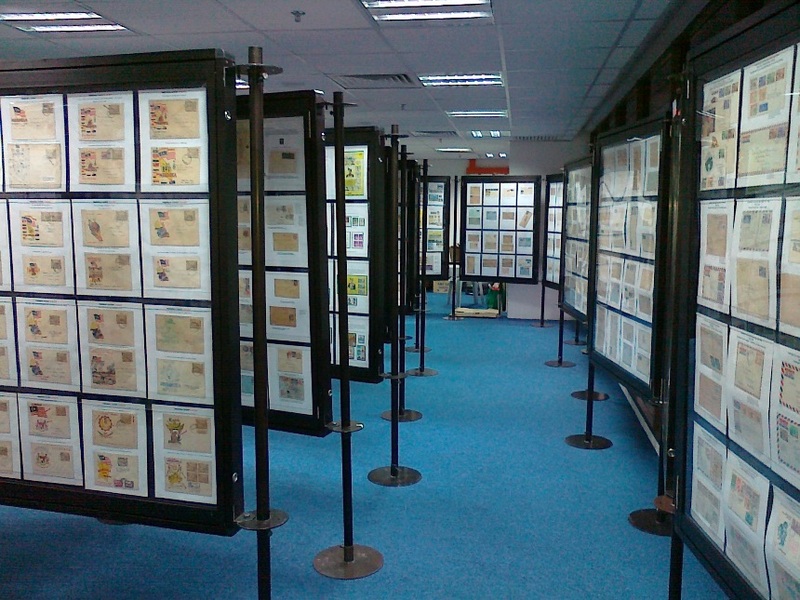 ALL the stamps and miniature sheets were sold out! So take note, the FDCs I have are the last of it. Turnout was reasonable today. I managed to spend time to look at the exhibitions. 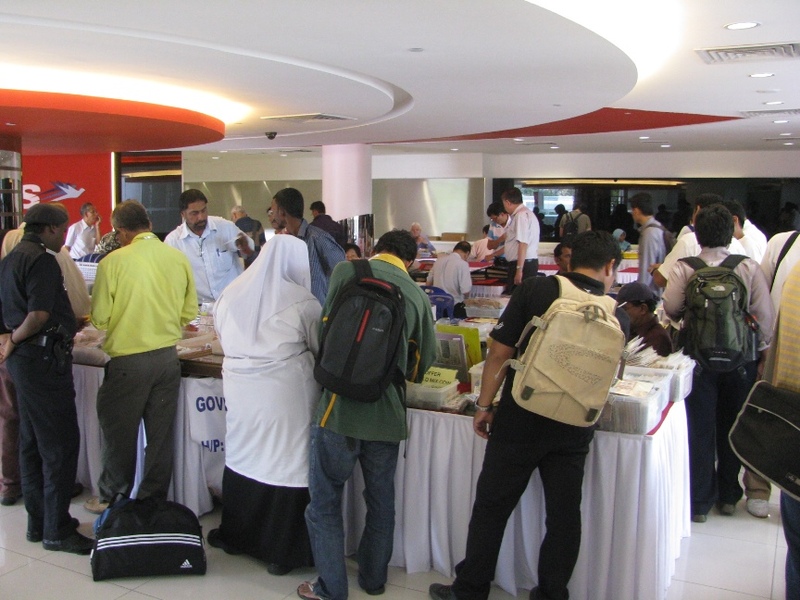 Cik Syadza from Hazel Design busy autographing. She designed the 90 sen and RM 2.00 stamps. This is one of the frames on private Merdeka covers! There were 5 frames on the private covers with the 1957 Merdeka covers taking 2 frames. 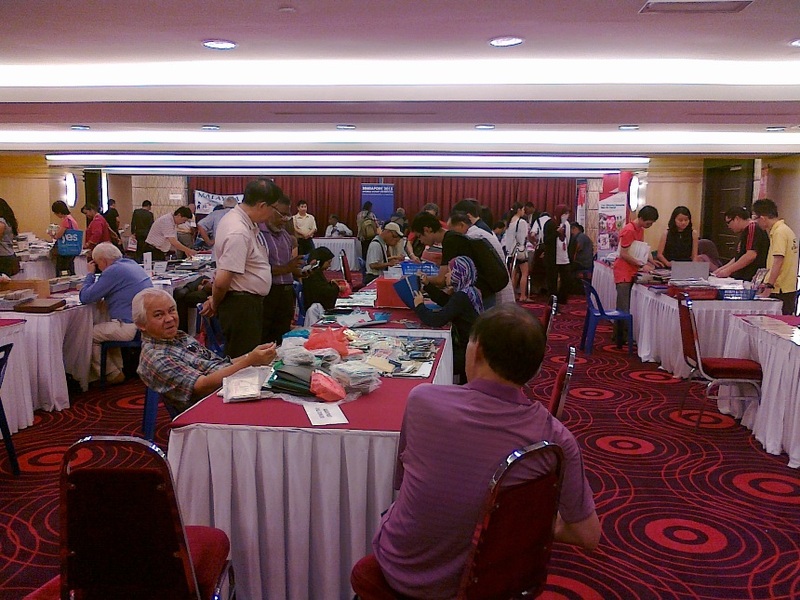 Here is the hall on the last day with the auction in progress at the back. 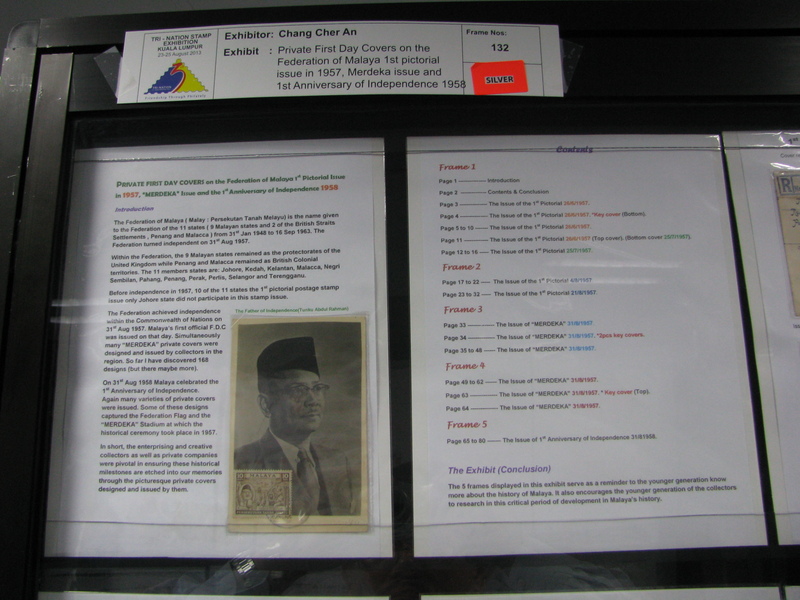 Here is the introduction to the Merdeka Private Cover frames that I am interested in, since Merdeka is only less than a week away…. I will be featuring the pictures of different Merdeka covers from these frames. It seems like a fitting tribute to the hard work to put the different private covers together.